Having acquired a 20% stake in Hanover Airport in 1998 and a further 10% in 2003, Fraport AG Frankfurt Airport Services Worldwide (Fraport AG) has signed an agreement to sell its entire 30% stake in Flughafen Hannover-Langenhagen GmbH (FHLG) to iCON Flughafen GmbH (iCON) – part of the iCON Infrastructure Group – for €109.2 million. The City of Hanover and the Hannoversche Beteiligungsgesellschaft mbH – a wholly-owned company belonging to the State of Lower Saxony hold equal shares in the remaining 70% of FHLG. The closing of the transaction is dependent on the contractually agreed pre-emption rights held by the two co-shareholders, with the transaction expected to be concluded within the next two months. Air Lease Corporation has initiated the sale of a portfolio of 18 aircraft to Thunderbolt II Aircraft Lease Limited (Thunderbolt II), a newly formed entity. The aircraft comprise a mix of narrowbody and widebody jet aircraft that, as of April 30, 2018, had an average age of 8.0 years and were leased to 16 lessees based in 15 countries. Air Lease Corporation and its Irish affiliate, ALC Aircraft Limited, will act as servicers and portfolio manager with respect to the aircraft. ALC estimates that the process of transfer and sale of the majority of aircraft will occur progressively during Q3 and Q4 2018. The Thunderbolt II structure included two series of Fixed Rate Notes and equity in the form of Aircraft Portfolio Shares (APS), comprised of 90% Global Aircraft Portfolio Shares (GAPS) and 10% Certificated Aircraft Portfolio Shares (CAPS). The CAPS were purchased by an investment vehicle controlled by ITE Management L.P., and ALC retained 5% of the equity as planned. Proceeds from the issuance of the Notes and the APS will be used to acquire the aircraft, fund certain accounts for the Notes and pay certain expenses. Russian independent maintenance, repair and overhaul (MRO) services provider S7 Technics Holding, has launched a new line station at Moscow’s Sheremetyevo airport, which currently serves more than 300,000 aircraft movements a year. West Star Aviation has named John Mansfield as Manager of Satellite Operations and Mobile Repair. Mansfield began his career over 30 years ago as a Technical Representative at Hawker Beechcraft. 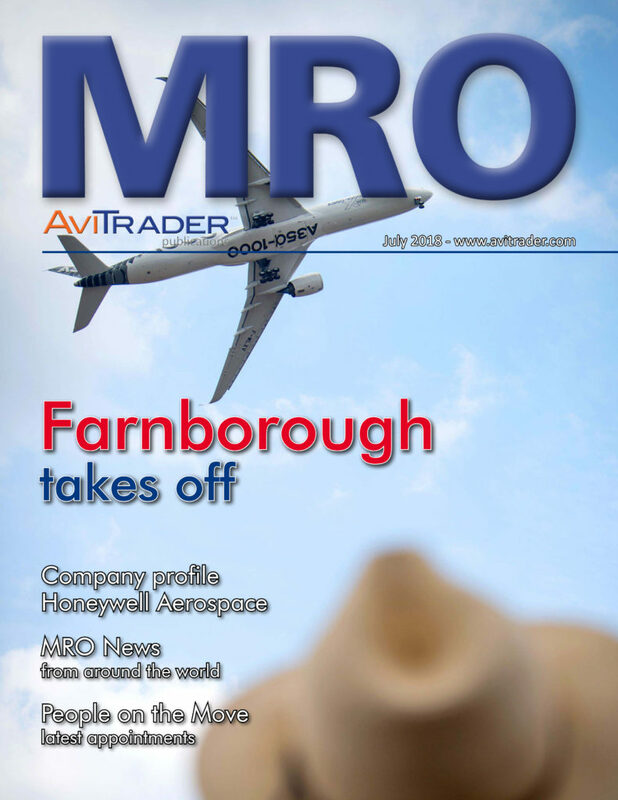 He quickly advanced into more progressive roles including Manager, General Manager, and most recently, Vice President MRO Centers Worldwide at Embraer Executive Jets. He will be responsible for overseeing satellite operations and the mobile response team. John has 15 years of proven experience in leadership, relationships with OEMs, as well as customer satisfaction and product support. Spatial, a provider of cabin crew training simulators, has announced that it is opening a US office to further support its global client base and expansion plans. Based near Los Angeles, the new office will be Spatial’s first permanent presence in the US. It will take advantage of the 12-hour time difference between the US and Dubai and provide true round-the-clock technical support to Spatial’s client base worldwide as well as deliver even stronger ties with both existing North American customers such as Spirit Airlines, WestJet and Alaska Airlines as well as new ones. C&L Aerospace, a C&L Aviation Group company, has completed the sale of Saab 340B+ MSN 368 to Air Rarotonga based out of the Cook Islands. A key component of the deal was C&L’s ability to trade in Air Rarotonga’s Saab 340A model and one CT7-5A engine to C&L. 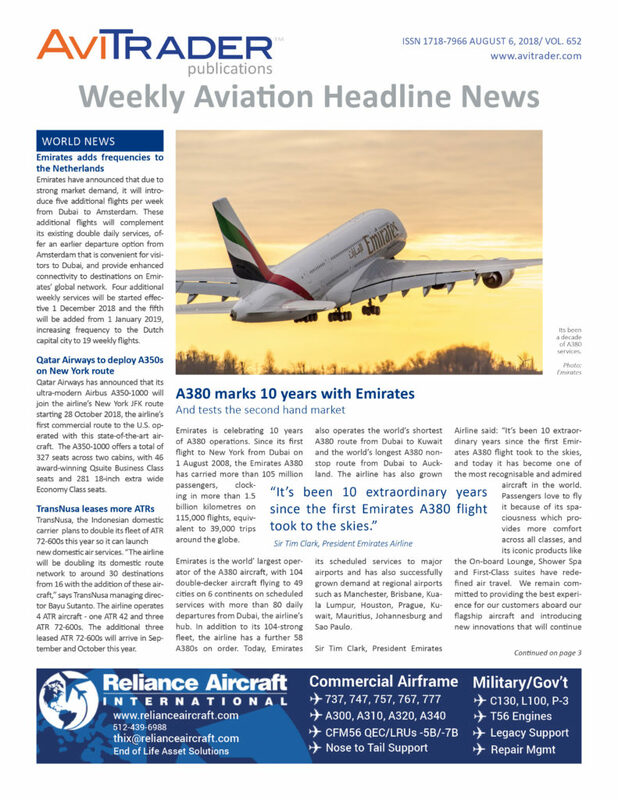 “This seamless transition for Air Rarotonga, from a 340A model to a 340B model, was made possible through the experience and versatility of C&L’s worldwide Saab support operation” said Jameel Wazir, Executive Vice President of C&L Aerospace. In addition to the sale, C&L refurbished the aircraft’s interior, painted the aircraft’s exterior with Air Rarotonga’s livery, and completed all required maintenance checks and updates. C&L has been a long-time Saab partner to Air Rarotonga. MRO service provider SR Technics has signed a contract with Malta Enterprise and Malta Industrial Parks Limited to expand its aircraft maintenance facility in Malta, following last year’s Memorandum of Understanding (MoU). The agreement includes the construction of a modern multi-bay hangar facility for narrow- and wide-body aircraft at Malta International Airport. With a size of 30,000 m², including workshop space, the new infrastructure will enable SR Technics to increase its capacity for heavy maintenance, C-checks and any cabin modifications or retrofits to up to six narrow-body aircraft at a time. Construction will begin this year, with a scheduled completion date of November 2019 for the first four bays. Operations will initially focus on the Airbus A320 family and the Boeing 737NG. To handle demand while the new hangar is being built, SR Technics will incorporate a third bay as of November 2018 in a temporary hangar next to the existing facility. Since the opening of the Malta operation in October 2010, the SR Technics Maltese employees – currently 260 in number – have serviced over 250 aircraft. With the support of the Malta government, SR Technics will hire and train approximately 350 new employees including B1 and B2 engineers, structure mechanics and technicians to join its highly skilled and motivated workforce. The Malta facility will continue to support both SR Technics’ strategic operations in Europe and the overall aerospace strategy of its shareholders. Egyptair Cargo has taken delivery of the A330-200 Passenger-to-Freighter (P2F) converted aircraft from the Elbe Flugzeugwerke GmbH (EFW), the joint venture between ST Engineering Aerospace and Airbus, following the successful completion of test flights in June and awarding of the Supplemental Type Certificates (STCs) by the European Aviation Safety Agency (EASA) and Egyptian Civil Aviation Authority (ECAA) in July. The timely redelivery of MSN 600 is a result of the excellent spirit of cooperation between the partners EFW ST Engineering Aerospace and Airbus and the remarkable support by EASA, Launch Customer Egyptair and the ECAA. To date Egyptair Cargo has firm orders for three A330-200P2F units. The A330P2F conversion programme, launched in 2012, is a collaboration between ST Engineering Aerospace, Airbus and their joint venture EFW. ST Engineering Aerospace, as the programme and technical lead for the engineering development phase, is responsible for applying for the STCs from EASA and the US Federal Aviation Administration (FAA). Airbus contributes to the programme with OEM data and certification support, while EFW leads the industrialization phase as well as sales and marketing for the freighter conversion programme. The re-delivery of the A330-200P2F marks the successful inauguration of the all new A330P2F family with the larger -300P2F being certified and delivered to launch customer DHL by end of 2017. The Latvian airline airBaltic has concluded the first half year of 2018 with a total revenue of €180.8 million, which is a 19% increase over the same period last year. At the same time airBaltic has carried 1.9 million passengers, an increase of 20%, and performed 13% more flights during the six months of 2018. On May 28, 2018, airBaltic announced a firm purchase agreement for the sale and purchase of 30 Airbus A220-300 aircraft with options for an additional 30 aircraft of the same type. The order complements the existing order of 20 A220-300 aircraft and forms the backbone of the new airBaltic’s business plan Destination 2025 that builds on the successful progress of the current airline’s business plan Horizon 2021, which has laid the groundwork for future expansion. airBaltic serves over 70 destinations from Riga, Tallinn and Vilnius, offering the largest variety of destinations and convenient connections via Riga to its network spanning Europe, Scandinavia, the CIS and the Middle East. For summer 2018, airBaltic has introduced eight new destinations from Riga to Malaga, Lisbon, Split, Bordeaux, Gdansk, Almaty as well as Sochi and Kaliningrad. In addition, airBaltic launched a new direct route connecting Tallinn and London. Swiss authorities have confirmed that all 20 passengers and crew onboard a vintage Junkers JU-52-HB-HOT were killed when the aircraft crashed in the Swiss Alps on Saturday. The plane was flying from Locarno, near Switzerland’s southern border, to the airline’s base in Dübendorf, a suburb of Zurich. While no early explanation for the cause of the crash has been suggested, the accident happened only hours after a family of four were killed farther west in the Alps when their small aircraft crashed. JU-Air owns three decommissioned former Swiss Air Force Junkers JU-52 aircraft and all future flights have been suspended. The airline was established in 1982 and with its three mid-century Junkers Ju-52 aircraft provides sightseeing, charter and adventure flights. According to Reuters, wreckage of the plane was in a basin at 2,450 metres (8,000 feet) above sea level surrounded on three sides by peaks. The Federal Office for Civil Aviation closed the airspace above the crash site and access to popular hiking trails in the surrounding area has been blocked.